Are Your Lotto Numbers Hot or Cold? This season is all about hot and cold. Winter up north, summer down south, a whole lot of Super Bowl Katy Perry, and lottery numbers of course! Read on to find out what it means to have hot or cold lotto numbers! If you’ve been following the US Super Bowl, chances are that you saw Katy Perry’s sensational halftime performance. The reviews are blowing hot and cold about her performance, but one thing that can’t be disputed is that Ms. Perry sure knows how to put on a show! Actually, one song that Katy is best known for is her hit Hot N Cold, but she didn’t sing this favourite at the Super Bowl. Powerball lottery is another big hit of the week and has some hot and cold of its own going on! Hot and cold numbers that is! Read on to find out what hot and cold numbers are, and whether your lucky numbers fall into either category. What Are Hot and Cold Lottery Numbers? Even though lottery draws are totally random, often certain numbers show up more frequently than others. These are known as hot numbers. Some lottery players like to play these numbers because they believe that they are likely to appear again. Numbers that are drawn with the least frequency are known as cold numbers. There are those lotto fans who prefer playing cold numbers, with the belief that they are bound to show up soon. Neither of these ways to choose numbers is scientific, because, each number has an equal chance of being drawn. That is the definition of randomness, after all. There are even those players who like to balance things out by choosing a combination of hot and cold numbers. We’ve done some homework and put together a list of the hot and cold numbers for 2014 for the world’s top lotteries. Each lottery has its own hot and cold numbers. You may want to use them when playing the lottery or not, but either way, it’s interesting to see which numbers came up the most or least frequently in 2014. US Powerball has stolen the lottery spotlight over the past few weeks with its massive and climbing jackpot! The prize is currently at $317 million (!!) so it’s the hottest thing happening in the lotto world. Fans are flocking to buy up their Powerball lottery tickets because a jackpot like this is not to be missed. No matter what you thought of the show, Katy Perry’s dynamite performance had the stadium’s crowds and TV viewers entranced. She performed a mix of her biggest musical hits, culminating in her Super Bowl ‘shooting star’ rendition of her hit Firework. Each song was accompanied with a thematic performance and stage setting, with Katy even donning a fire dress and riding on an imposing, robotic lion for her hit song Roar. What did you think of the performance? Just like you didn’t need to be sitting in the University of Phoenix stadium to experience Katy’s show (YouTube and TV did just fine), you don’t need to be in the US to take part in the US Powerball lottery draws. Simply log-on to your online account and purchase Powerball tickets online! We’ve even launched a spectacular Powerball syndicate to celebrate the enormity of this jackpot. You can buy shares for the 1000-line random selection Powerball syndicate, which will give you 1000 times greater chances of winning! 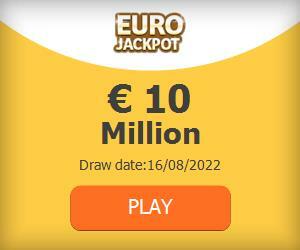 Can EuroJackpot Go the Distance?